The Northrop XP-79, USAAF project number MX-365, was an ambitious design for a flying wing fighter aircraft, designed by Northrop. It had several notable design features; among these, the pilot would operate the aircraft from a lying position, permitting the pilot to withstand much greater g-forces in the upward and downward direction with respect to the plane – and welded magnesium monocoque structure instead of riveted aluminum. In 1942, John K. (Jack) Northrop conceived the XP-79 as a high-speed rocket-powered flying-wing fighter aircraft. In January 1943, a contract for two prototypes (s/n's 43-52437 & 43-52438) with designation XP-79 was issued by the United States Army Air Forces (USAAF). Originally, it was planned to use a 2,000 lbf (8,900 N) thrust XCALR-2000A-1 "rotojet" rocket motor from Aerojet that used mono-ethylaniline fuel and red fuming nitric acid (RFNA) oxidiser. However, the rocket motor configuration using canted rockets to drive the turbo-pumps was unsatisfactory and the aircraft was subsequently fitted with two Westinghouse 19B (J30) turbojets and re-designated XP-79B. After the failure of the rocket motor, further development of the first two prototypes ended. To protect the pilot if the aircraft was damaged in combat the XP-79 was built using a welded magnesium alloy monocoque structure with a 0.125 in (3.2 mm) skin thickness at the trailing edge and a 0.75 in (19 mm) thickness at the leading edge. The pilot controlled the XP-79 through a tiller bar and rudders mounted below; intakes mounted at the wingtips supplied air for the unusual bellows-boosted split ailerons. 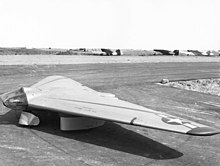 To test the radical design, Northrop was given a contract to build three glider demonstrators, to designs from the Engineering Division of the USAAF Materiel Division. Given the Northrop designation NS-12, the three gliders were also given project numbers from the USAAF. Confusingly, two project numbers were used, one MX-324 when discussing secret aspects of the powered gliders, and another, MX-334, relating to the aircraft when being built and flown as pure gliders. The MX-334 emerged as a flying wing glider with no tail surfaces, similar in layout and construction to the Northrop N-9M. Completed in late Spring 1943 the no.1 MX-334 was tested in NACA Langley's wind tunnel, after which a large wire-braced fin was added to ensure directional stability at high speeds. The first flight attempts was carried out by the no.2 aircraft towed behind a Cadillac car for low level take-off and landing tests, with no success. After modifications the first launch was carried out on 4 September 1943, towed behind a large truck. For more comprehensive testing, a Lockheed P-38 Lightning was used to tow the aircraft on its first proper flight on 2 October 1943. In early 1944 the no.2 aircraft was modified to take the 2,009 lbf (8,940 N) Aerojet XCAL-200 rocket motor, reverting to the "secret" MX-324 designation. The aircraft was also fitted with combined rudder and airbrakes outboard of the elevons. Testing with the rocket motor commenced on 22 June 1944, with the first aerotow launch for a powered flight on 5 July 1944, making it the first US-built rocket-powered aircraft to fly. Flight testing was concluded by 1 August 1944 and the two remaining aircraft were disposed of. The no.3 MX-334 was written off on its second flight, on 10 November 1943, after Harry Crosby lost control in the prop-wash of the P-38 tug. The XP-79B (after delays because of bursting tires and brake problems on taxiing trials on the Muroc dry lake) was lost during its first flight on 12 September 1945. While performing a slow roll 15 minutes into the flight, control was lost for unknown reasons. The nose dropped and the roll continued with the aircraft impacting in a vertical spin. Test pilot Harry Crosby attempted to bail out but was struck by the aircraft and fell to his death. Shortly thereafter, the second prototype (43-52438) and the overall project was canceled. Northrop company designation for the MX-324 programme. Northrop designation for the XP-79 programme. The "secret" designation for the powered version of the MX-334 glider. Only used for the no.2 glider, when powered by a single 200 lbf (890 N) Aerojet XCAL-200 liquid-fuelled rocket engine. The designation used to describe the pure glider version ( including the no.2 aircraft before it was fitted with the rocket engine). The initial design for a rocket powered fighter, to have been powered by 2 x 2,000 lbf (8,900 N) Aerojet XCAL-2000 liquid-fuelled rocket engine. Three aircraft were ordered but only one was completed, crashing on its first flight on 12 September 1945. ^ "XCALR-2000A-1". www.astronautix.com. Retrieved 9 February 2018. ^ a b Winchester, Jim (2005). The world's worst aircraft : from pioneering failures to multimillion dollar disasters. London: Amber Books. pp. 150–151. ISBN 1-904687-34-2. ^ a b c Campbell, John M.; Pape, Garry R. (1995). Northrop Flying Wings : a history of Jack Northrop's visionary aircraft. Atglen, PA: Schiffer Pub. pp. 93–107, 252. ISBN 0887406890. 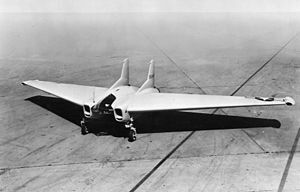 ^ "The Northrop XP-79 jet-powered flying wing project was cancelled after the single prototype was lost to an accident". Military Factory. Retrieved 8 June 2018. Jenkins, Dennis R.; Landis, Tony R. (2008). Experimental & prototype U.S. Air Force jet fighters. North Branch, MN: Specialty Press. ISBN 978-1-58007-111-6. Wikimedia Commons has media related to Northrop XP-79. This page was last edited on 29 July 2018, at 17:55 (UTC).